We have the ability to set several different AT-RISK Criteria, including number of Failures, Absences, Tardies, Discipline, and more. Currently we are focused only on Failure Reports for At-Risk information. 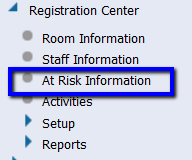 The At-Risk Information is a searchable live database of students that are, or have been At-Risk. If you are frequently checking in on students on this list, you may want to add At-Risk Information, and IPR Summary as a favorite, so that you can navigate between the two easily. When you first open At-Risk Information, you see over 7,000 students, as it is not filtered by building, or for Active/Inactive status. The most basic search is displayed below. We are filtering students based on Current Status, and Building Number. You can use these criteria to search by grade-level, or any other criteria available in the pulldown menus. This is still a LOT of students to page through, so you should filter further. Now we see a much more manageable list of currently At-Risk Students. Once you have selected the student, go to Student Center - Mark Reporting - IPR Summary to see the scores that were used to calculate At-Risk Status. Clicking on the Ar-Risk Factor (In this case, YES) takes you to the At-Risk Detail.